Sponsored by the Society for Learning Analytics Research (SoLAR), the Learning Analytics Summer Institutes (LASI) have become established in the last two years as an awareness-raising, capacity-building, international network of events, where researchers and practitioners can meet to share their work, and envision the future. This year, 2015, sees an exciting new development. 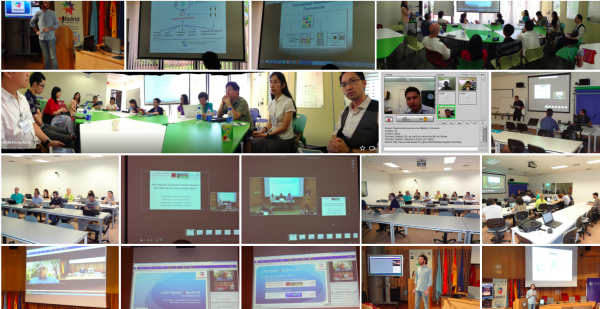 Instead of convening a 3 day ‘hub’ gathering in the US, live-streaming invited keynotes and panels to the world, with “LASI-Locals” tuning into the webcasts and running their own parallel activities, we are decentralizing further. LASI15 will be fully distributed, comprised of locally-tuned, self-organised events. A new, free SoLAR service is designed to assist this: we are crowdsourcing and curating video materials that LASIs can draw on. In particular, SoLAR invites anybody who wishes to share a video presentation about Learning Analytics to propose this to the SoLAR InfoHub. We’re developing the InfoHub as a new go-to source to find quality learning analytics resources including videos, articles, reports, slidesets and courses. Once your proposed video is accepted, it will be indexed and more discoverable. The InfoHub will be available before, during and after LASI week. Schedule your LASI-Local during the 2015 LASI week of15-19 June, if possible. But some events will be at other times to better suit their community. how about connecting two or more LASI events live around themes of common interest, or language? We encourage you to share the news and resources from your LASI before, during and after, including of course, slides and video recordings if you have capacity. Please use the LASI15 banner on this page to mark that you’re part of this international network. Any queries, please email LASI15 Chairs Simon Buckingham Shum and Xavier Ochoa with [lasi15] in the subject line. When you’re ready to announce your LASI, email Andre Ortega to add the link to the page. You can post news any time direct to the LASI Community with the prefix so that it can be easily found in an events search. If you have any questions about running a LASI, don’t hesitate to get in touch. LASI15 events will be added as we hear of their planning, and linked as soon as their websites go live. This could be anything that you think the community should know about, and which a LASI event might use to enrich their event, e.g. SoLAR is about to add a lot of new material to the SoLAR YouTube channel, but beyond SoLAR’s own video archives for LAK and LASI, many other seminar series, conferences and projects have shared freely accessible videos, and it is these that we wish to make more discoverable. When you propose a video for review, you’ll be asked to index it to help others discover it. The video proposal form on the InfoHub will go live soon. Meantime, get thinking and talking with your colleagues, and we welcome your thoughts on how to make this year better than ever! With thanks to Nordic Factory for cool flag icons!